Home > Lighting > Candle Holders > Beaded Real Crystals Candle Holder - Goblet - "Prestige" - 15" Silver - BUY MORE, SAVE MORE! 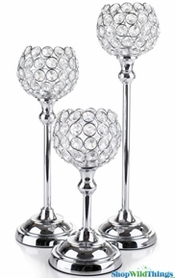 Our stunning new line of Silver and Crystal Candle Holders is sure to turn heads! 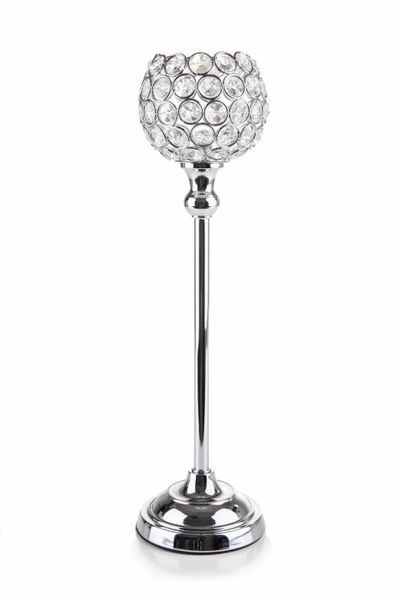 This "Prestige" candle holder features a 4" wide silver and crystal goblet that comes with a removable votive holder that's 1.5" in diameter and .5" tall. The actual candle plate is also 1.5" in diameter. The goblet sits atop a beautiful silver pedestal and the entire candle holder is 15.5" tall. 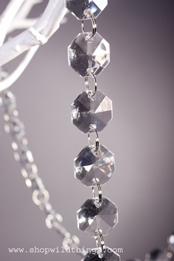 The crystal beads are faceted for maximum shine and they have superb clarity. 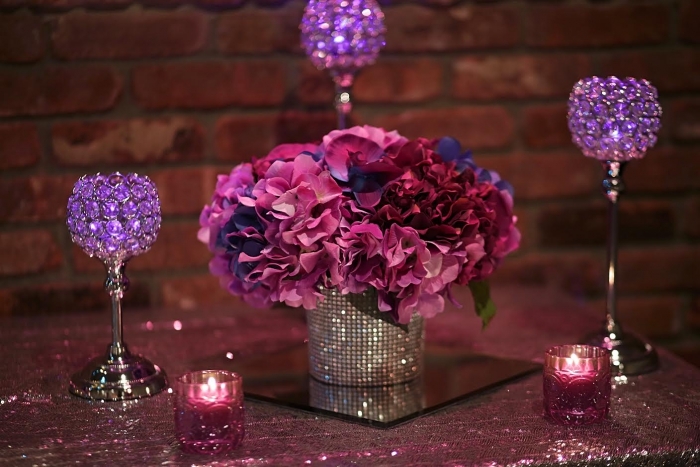 Simply add a flameless candle (about 2" tall would be perfect) or a Floralyte LED light and you're ready to go. 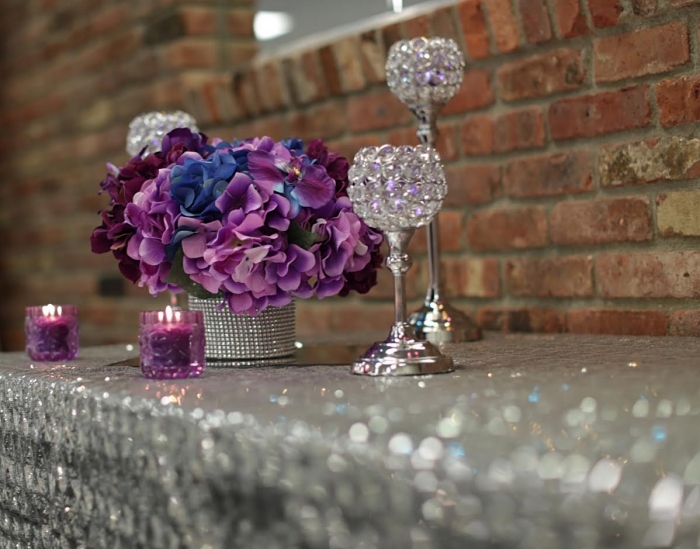 This candle holder is dazzling on it's own but placed on a mirror with our matching crystal gem pillar holders, votive cups and our 37" "Prestige" Stand and you've instantly created a sparkling display that will have your guests saying WOW! I purchased 2 sets/ three in different heights. They made the cake table look elegant. I would not use real candles, I recommend using LED lights. Merchant Response:Beautiful photos!! Thank you so much for shopping with us and sharing your photos, you did a fantastic job! I�€™m a very �€œgotti�€ person. Have lots of crystal in my house. Bought two of these with the battery operated tea light candles for my front entrance. My home is cozy, blingy, classy with these! I wasn't quite sure when I ordered that they were what I needed. They not only met, but far exceeded my expectations. I am thrilled with them. Nice height for a table. I used the whole collection for a sweetheart table. Nice a sturdy! Glad to have it in my inventory! I purchased this candle holder along with the 9 and 12 inch ones. They look beautiful together and make a beautiful addition to my home decor. Very beautiful, dainty, and elegant. I have them on the fire place mantel and they are gorgeous...they match my end table lamps. ConsWould have liked the goblet part to be 1" wider but it is fine the way it is. The Crystal CandleHolders are perfect! 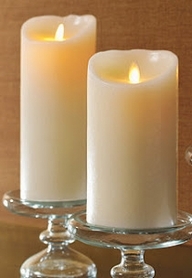 I am using the candle holders as a centerpiece for my daughter's Sweet Sixteen along with the smaller version. They look beautiful. Very beautiful items. I bought the 9, 12, and 15 in crystal candle holders for the sweetheart table for a wedding. The customer service is great!! I would most definitely buy from Shopwildthings.com again.